While going ahead with the comment import process, it is possible that it may not complete successfully. In such a case, do go for a second attempt because most bloggers report the second attempt to be always successful. So—never quit—if the first attempt is unsuccessful. Before we start, I'll recommend trying it on demo Blogger blog with a few dummy posts and dummy comments. This way, you'll get familiar with the entire process without fear of breaking the live blog. As indicated in the opening paragraph, we need to configure a few simple settings on our Blogger blog to ensure a smooth comment importing experience at the other end. To get started, log in to your Blogger dashboard and select the blog you want to work with. Now go to Settings → Posts, comments and sharing → Comments section. Here, you'll find several settings related to the blog comments. You need to make sure that for the 'Comment Location' setting, the 'Embedded' option is selected. For the 'Who can comment?' setting, choose the 'Anyone' option. Rest of the settings can be left in their default state. Failing to comply with this setting will stall the comment import process. So, make sure your blog has this specific setting configured—without any fail. At this point I'm assuming that you've already created a Disqus account for your blog and have done all the preliminary setup. This also includes installation of the Disqus comment system on your blog. Once it is completed, go back to the Disqus dashboard and follow the instructions given below. Start with going to the Admin → Community → TOOLS → Import option. By default, the WordPress comments import page will open on reaching this option. Select the Blogger option as shown below. Picking this option will present the 'Import comments from Blogger' button. Before clicking this button, I'll recommend logging in to your Google account associated with your blog. Upon clicking this button you'll be asked to choose the Google account through which you manage your Blogger account. 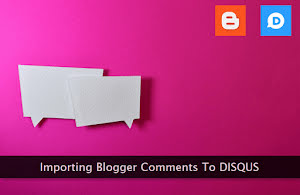 After choosing the right Google account, a dialogue prompt will ask you to allow Disqus to access your Blogger account. Click the 'Allow' button to complete this step. Once you've given the permission, the list of blogs within your Blogger account will be presented to you. Select the right one by clicking on its entry. Upon selecting the right blog, you'll be redirected back to the Disqus import page from where you started earlier. At this point, the comment import process will start in the background. You'll notice that the comment syncing option has also been enabled—automatically. Initially, it'll show that zero comments have been synced. If there are a limited number of comments, it may take a few minutes before the updated synced value will start appearing in the dashboard. If the volume of comments is huge, it may take 15 to 30 minutes before the final synced value will appear in the dashboard. So, make sure you give the process ample time before expecting its quick completion.